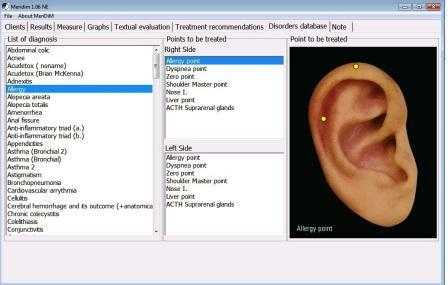 After the measuring process the computer software selects individually an ear acupuncture therapy protocol (in harmony with traditional Chinese medicine). The recommended therapy is demonstrated step by step on a photo of a human ear. We have further increased the range of therapeutic modules of MeriDiM Meridian Digital Diagnostic Device. 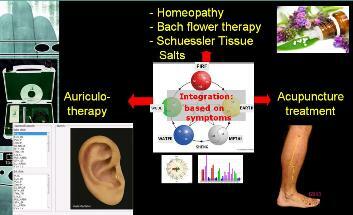 Integrating several aspects of energetics medicine (ear acupuncture, homeopathy, Bach flower remedies, Schüssler salts, body acupuncture, bioenergetics, kineziology) we have added another module: the complex H-B-S Module. So following a ’tailor-made’ individual diagnostics measurement we can choose as a treatment protocol not only ear acupuncture, but also homeopathy, Bach flower remedies and Schüssler salts in harmony with the measured values of our client. Thus harmonizing different meridian disorders we are able to favourably influence biological functions in an integrative way. What we do that way is nothing more and nothing less than improving biothermodinamic states of our body! I.) The description of the state of meridians corresponding with abnormal values. Following that we can see treatment information in four fields. 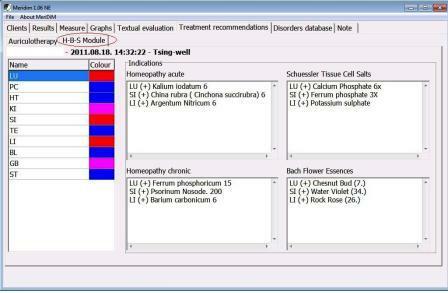 The MeriDiM user can decide if he or she should recommend homeopathic remedies for acute or chronic conditions. A condition is chronic if a client’s certain meridian value is abnormal for a longer period of time proven by several measurements. Preceeding the name of the the remedy we can find letters (shortened name) indicating the meridian which was measured as abnormal, e.g. : ’KI(-) Chininum sulfuricum 5’ refers to Kidney meridian indicated Chininum sulfuricum suggestion, 5 indicating CH 5 potential of the remedy. It is important to note that we should only recommend, not prescribe remedies! Similarly: Benzoicum acidum 5 means Benzoicum acidum CH 5. Beside each recommended essence one can find its official number. Recommended therapies of the H-B-S Module can be applied to all previous measurement results. Concerning homeopathic and Schüssler remedies as well as Bach flower essences one should note the special precautions. • keep the remedies beside mobile phones, televisions or other electric appliances. • take anything containing menthol/peppermint/camphor while applying homeopathic remedies. Half an hour before and after taking the remedy we should not chew, swallow anything, because that can decrease the effect of the stimulus. That is why we should not drink, eat, smoke or wash teeth during those periods. 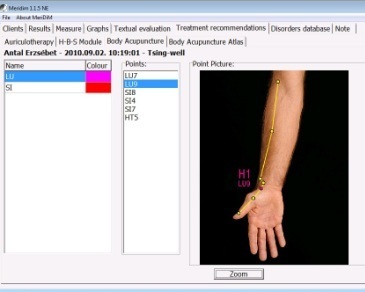 Besides offering treatment recommendations to acupuncture, auriculoacupuncture, acupressure and reflexology professionals following customised energetical assessment it also serves as an atlas of body acupuncture. It contains the various groups of the Key Points of the 12 main meridians (Alarm points, Meridian starting points, Meridian end points, Passage-points, Ryodoraku points, Shu-points, Source points, Sedation points, Toning points and Tsing points) including the names, characteristics, localisations and indications of the applied points. From among diagnoses rendered in alphabetical order the therapist can choose according to his or her considerations. 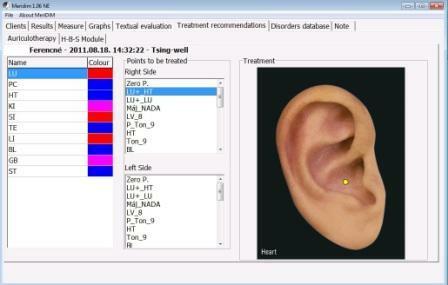 He/she is helped by a photographed ear illustration, where the therapist can follow the protocol step by step.